1111 Meaning - What Does Seeing Angel Number 11:11 Mean? Angels and Spirit guides communicate their love and guidance in many ways. Seeing the angel number 1111 is a common sign from Spirit and the realms of angels. For example… Do often look up at the clock and notice it's 11:11? Is this happening to you? It’s happening for so many people right now! So what does it mean when you keep seeing the angel number 11:11? Whether it’s on the clock, on license plates, apartment doors, the number of Facebook comments or YouTube likes, or any other places, 11:11 is a definite message from Spirit. If you like this video, be sure to Click Here to Subscribe on YouTube!Want to Learn more about Angel Numbers in general? Click Here! 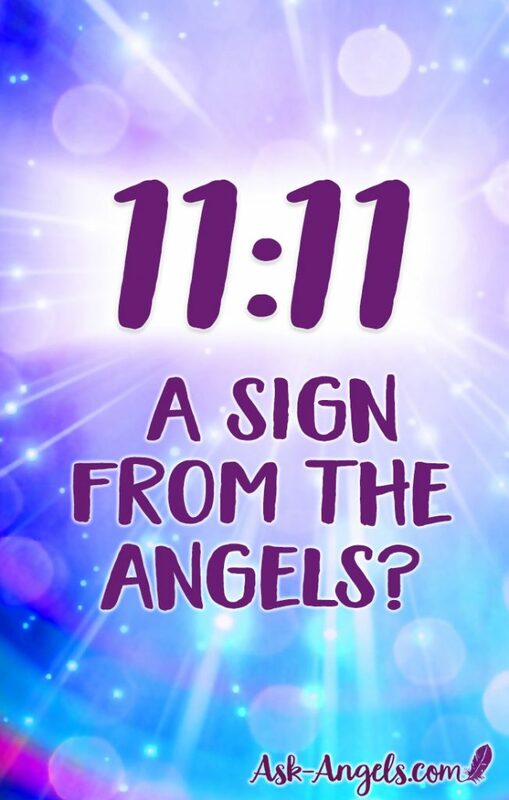 So just what does seeing angel number 11:11 on a regular basis really mean? Numbers are a universal language. They are a powerful way for spirit to communicate with us in the physical world. I’ve written below about the many different meanings of seeing 11:11. But truly, when you see 11:11, there is a personal meaning for you. The specific message depends on where you are in the present moment. It depends on what's happening in your life and how far you've progressed on your awakening path. The more you pay attention, 11:11 brings a message of oneness and unity which helps you to see, feel, and experience your connection with the Angelic realm. As you progress further, it’s direct guidance from your Angels to stay positive. They are sending a sign that they are with you. 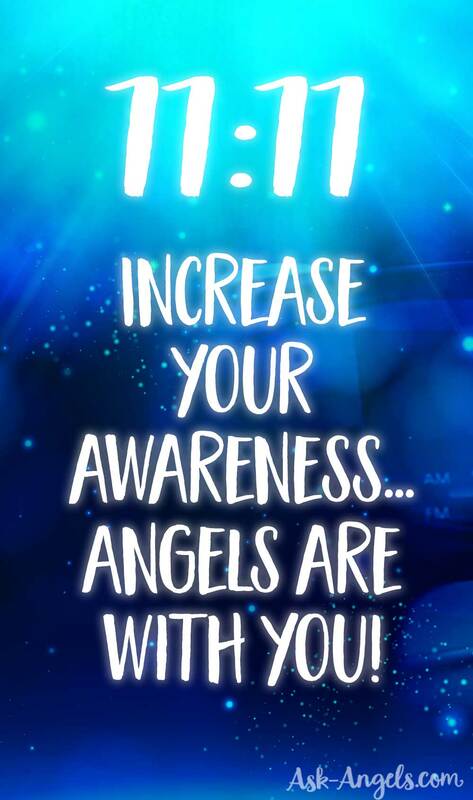 The most up-to-date guidance that I have gotten from the Angels and my higher self regarding the meaning of the awakening code of 11:11 is powerful. It is a signal from spirit, your Angels, spirit guides, Ascended Masters, and your team in spirit (and yes, even if you don't yet realize it, you are guided and loved and supported by so many beings in the spiritual realm!). 11:11 is a call to tune into their love and guidance. Diving even deeper, 11:11 is a call to tune into the codes of awakening, the ascension light, and the DNA activations of the realms of spirit. Humanity and the earth are in the middle of an ascension process. More light and higher vibrations are available now than ever before. But we have to choose it. Do you open the door? Do you receive the codes of awakening? Do you accept the gifts that are being broadcast your way? This is the opportunity of 11:11. When you see 11:11 on the clock, instead of going to your phone and Googling what it means, I invite you to enter inward. That's where you can get the most up-to-date truth and relevant guidance. That's where you’re able to receive the incredible light frequency that is streaming onto the planet. I think or say, “Guides, Angels, Ascended Masters, thank you. Thank you for this sign and reminder to embody my light, to experience my unity with all of life.” Then I take a moment to just breathe in all that is and tune into my oneness with the light, earth, and everything in existence. Then open your heart and mind to expand your awareness. Embody the presence of your higher self – which is all around you. Tune in to your ascension column, to the torus of energy that is your light body. Open your heart, let your energy glow vibrantly like the sun, and then expand further. From this place, I invoke and call forth the codes of awakening, the light frequencies, guidance, love, healing, and activations that are available for me right now. I call it in and forth. Then focus within, open your heart, and receive the light encodements, activation, and love. If there is guidance available for you from your Angels, this is how you receive it. Through raising your vibration and becoming a vibrational match for the Angelic guides and Ascended Masters. When you match their vibration, you're able to tune into their guidance. It’s that simple and that profound. Lift your vibration and when you see 11:11, know that it means there's greater light available to you. It means that you are authentically a light being; a way-shower in this ascension process. You are a spiritual being in physical form and you are here on earth to awaken to this higher truth. Even if you're already awake, there is always a further. There are light waves streaming onto the planet and into your present point in time. Your Guides and Angels keep ringing the doorbell, showing you 11:11. Wake up, open up, expand out, tune in! Claim the activations and the light codes when you see 11:11. The time is here; the opportunity is now. You are so guided, loved, and supported by all of the Angels, the entire realms of spirit, and by all of the universe. Lift, lift, lift in love and light and connect with even higher levels. This is your opportunity and your invitation when you see 11:11 right here and now. 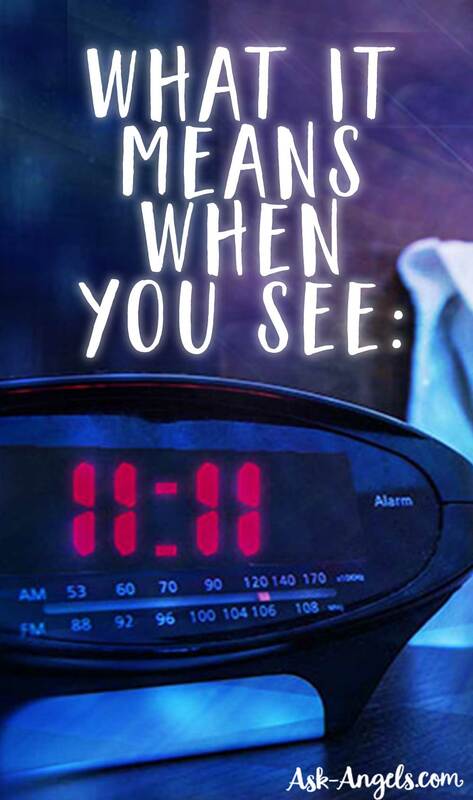 What Does Seeing 11:11 Mean For You? The truth of the matter is, 11:11 is subject to interpretation, and there are different levels and layers of meaning depending on where are are and what is transpiring in your life when you see 11:11. There is really no right or wrong answer when it comes to the question of “What does it mean” for you? This is because the exact meaning of seeing 11:11 depends on what is happening in your life, what you're working on, thinking about or considering right before you see 11:11. There are however some more common meanings that can give you some clear insight into understanding what seeing 11:11 means for you, and that is exactly what I'm about to cover here. I'll be honest with you… When I first started noticing 11:11 on a regular basis, I didn't know what it meant either, but I intuitively felt there was a deeper spiritual significance than just some numbers on a clock. And now that I've learned to connect with angels, taken the time to meditate and listen for the deeper meaning when 11:11 appears for me, and tuned into the angelic guidance and insight around the time of seeing these numbers… I can verify, that there absolutely is a deeper meaning present when you see 11:11! First and foremost when you see 11:11… Pay attention! 11-11 is almost always a sign to be more aware! Plus, with awareness and presence, you can then tune into the deeper meaning of seeing 11:11 for you in the moment. So, when you see 1111, pay attention to what you were just thinking about, as well as what is happening around you. 11:11 can sometimes be a call from the angels to pay attention to your thoughts and a reminder that your thoughts are manifesting… So keep them positive! 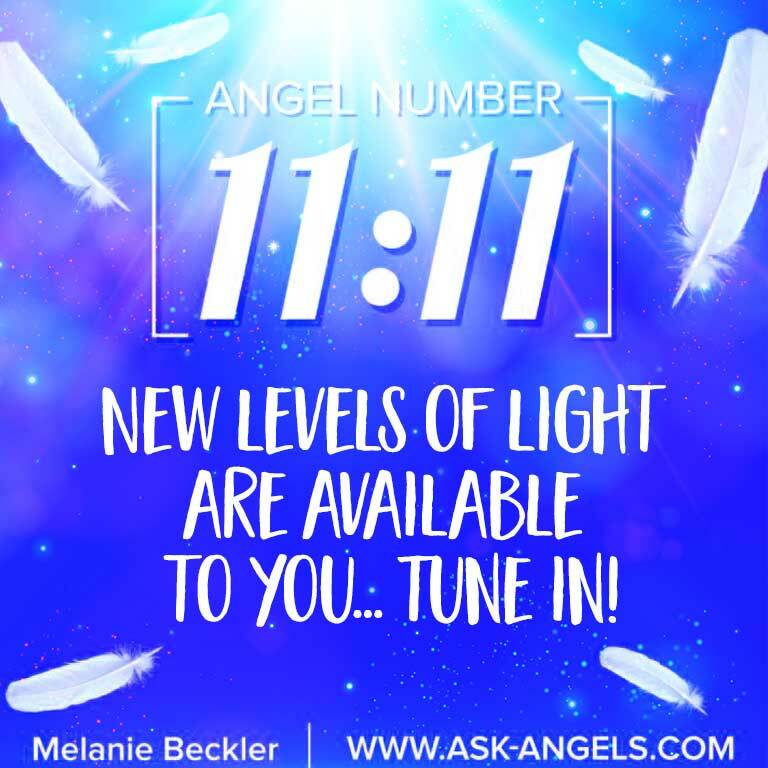 11:11 can also mean your angels are reaching out with love, guidance and frequency… With awareness, you can then begin to feel and experience their love, and presence and tune into the additional messages from your angels in the moment. So, first and foremost, be aware in the moment when you see 11:11 as this is the foundation necessary for you to then decipher the additional layers of hidden meaning behind seeing 11:11 for yourself. One of which being… Your guides and angels are near. Your Guides and Angels Are Near! 11:11 is often said to be a doorway between realms, and really there is some truth to this. I mean, the reality is that the spiritual realms are always all around us… But when you see 11:11 it often signifies that your Guides and Angels are trying to contact you, as it is a sort of calling card for many spiritual beings. When you see 11:11 it's a sign and a call to directly connect with the light and love of the Divine and angels that you are One with. Take a deep breath, quiet your mind, and enter inside to tune into the messages your guides and angels have for you when they whisper in your ear to look up at the clock… right at 11:11. Seeing 11:11 is an invitation to awaken to experiencing the larger picture. It is a wake-up call of sorts to tune into the realms of spirit and experience your oneness with all of life including all that lies beyond the veil of illusion. Noticing 11:11 on a regular basis is most often experienced by those who have begun their spiritual journeys or are about to embark on a journey of discovery. If you haven't yet started seeing 11:11, the fact that you're reading this article, means it may soon begin to appear. Perhaps 11:11 holds a code to help you unlock the secrets of your subconscious mind and to get in sync with the greater workings of the Universe and your authentic purpose and reason for being here. It's a call to raise your vibration, step into your light, and get to work on your life purpose of brightly shining, living as the powerful spiritual being you are, teaching by example and making a difference in the world. 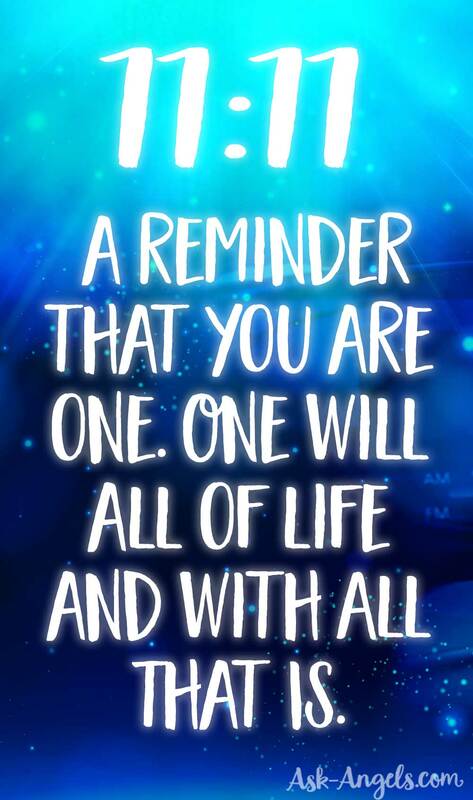 Seeing 11:11 is a reminder that you are one. One will all of life and with All That Is. The moment of seeing 11:11 is an awakening call and an open invitation to open your heart, raise your vibration and tune into this higher vibrational experience of oneness. Lift in the light that is all around you and experience your oneness with the Divine. Additionally, 11:11 is a vibrational reminder that the past, present, and future are all simultaneously interwoven now, 11:11 reminds you of this Divine interconnected-ness of the One Life Force Energy flowing throughout everything! Seeing 1111 also represents intuition, creativity, genius, refinement, and fulfillment. Perhaps 11:11 is working to awaken you to express these qualities in your own life. 11:11 presents an opportunity to reflect on your purpose for being here. It is a call to return to oneness and balance, to pay attention and to claim your power by mastering the life lessons before you. 11:11 represents a portal or doorway opening into a higher level of light. Stepping through the 11:11 Gateway is stepping into the highest possibilities for your life! Check out the 11:11 Gateway Activation's! Channeled with The Council of Light, these incredible guided meditations will guide you to effortlessly tap into your highest divine light and authentic soul expression. Receive the highest levels of ascension light and crystalline consciousness available to you now as you're lovingly and beautifully guided to relax, breathe and lift into sync with the higher realms so you can embody your highest light! So 1111 in numerology carries all these influences… multiplied! I love numerology and have found a great deal of insight about myself and my personality thanks to numerology. 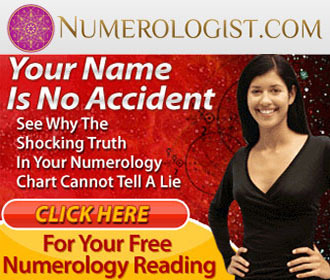 If you have not experienced a professional numerology reading, click here and get a free numerology reading, now! 11:11 … Make a Wish! It's 11:11… Make a wish! Have you ever heard this? Does 11:11 have some sort of magical wishing power? Really, it's in line with keeping your thoughts focused positively towards what you want to manifest. 11:11 is a reminder that our thoughts are manifesting… When you see this number focus on what you want! Wake up and take control of consciously creating blessings in your life! 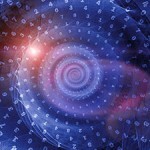 Pay attention, be aware, and know that there is much more going on than can be perceived with our physical senses. 11:11 is a beautiful reminder of the synchronicity present, when we are following our hearts, and moving forward in life with love. Deeper meaning and angelic guidance through numbers does not only come through with 11:11… There's a deeper level of meaning regardless of whether you're seeing 2:2:2, 12:12 or 3:3:3, 444 or any number sequences. Whatever number sequences you’re seeing, know that the message is highly personal. Yes, you can read about the meanings on my site, you can search Google and find answers, but that’s only the bottom rung of the ladder. Keep climbing, keep going deeper within. There's deeper meaning specifically for you and it can only be found within. Turn up the volume of your light and tune into the codes of awakening, to the expanded crystalline consciousness, and to the presence of Angels. It’s all here waiting for you. It is literally reaching out and pinging you with signs. When you receive these signs, open your heart, tune into your light, enter inward and receive the blessing that is available to you right here and now. I hope that the next time you see 11:11, you take it as a sign that you're on the right track. But there's always a further, and 11:11 is that doorbell ring. Go answer the door by opening your heart and entering inward. Thank you for being here. Thank you for shining your light and for standing in your truth! P.S. Curious about other number sequences? Check out the meaning of more angel numbers below! P.P.S. Do you see 11:11 often? What other angel numbers are you seeing on a regular basis? Learn more about angel numbers and their meanings in The Complete Guide to Angel Numbers. 11:11 plays a huge roll in my life. My father passed on 11-11-2012, Remembrance day in canada ..and every time I see 11:11 I feel his presence. I feel him close and it always brings a smile to my face. I also see 444, that used to be my father’s union number thru Chrysler. So every time, I see this I also feel the love we shared and that he is constantly looking out for me and our family. He will always be close and closer when these numbers appear. 11.11. is my birthdate, such a surprise! Last night, I woke up at 11:11. I thanked my angels for the message (not knowing what it was) and went back to sleep. Then, I woke up at 1:11. Again, I thanked them and went back to sleep. When I looked up these numbers today, I was so excited to read what it meant! A few weeks ago, I woke up at 2:22, and a few weeks before that it was 4:44. I love that my angels are trying to contact me. I don’t want to miss out on doing what they want me to do. What is my next step? For the past 5 months or so I have been seeing the clock at 11:11, 2:22, 1:11, 3:33, 4:44, 5:55, 10:10, and 12:12 and it always made me really happy to know that my spirt guides where looking out for me and saying hi. But then a few days ago it stoped! Any ideas of what this could mean?? This needs to be better known. It is so important that this gets out there that I am willing to waive attribution. 1111 – a Key for it is that opposing poles can cancel out generatively (rather than entropically). It is an odd number in base 10 (denary) and base 2 (binary), yet has an even number of digits. So it shows that odd and even numbers both exist. It is 111 overlapped and merged inwards to one degree of overlap. This is important – it shows that Odd Numbers are made of opposing, generative poles *and* defined centres. So focus on the 1111 signal with these key understandings, and translate the rest with your Chakras. The rest of the translation should be done in the Chakric Tongue. Nice video thanks so much I never know that have a lot of meaning it’s amazing God bless you. As i was reading this..i looked up at the time on my phone..it read 11:11….AMAZING!!!!! I wake up and see it on my clock. .or go by the clock on my stove and 11:11 is there.and becoming more frequently, like just this morning I was sitting having a coffee and my cellphone lite up and I looked at it and in big letters 11:11.sort of freaking me a little but not really. .my wife of 34 yrs passed away 14 months ago and it’s been really hard for me…I take it as a good sign. .thanks for listening. I must say this is really scary yet the most informative for me because recently, about two years now, I’ve sensed there’s more to me than meets the eye and though I’ve struggled to make my life meaningful and it always seemed tough, I started seeing numbers… And it was really crazy!! I see 1111,1221, 1212, 2112, 222, 555, 4444 in these particular order, It was really do much that I looked it up and those it says allot of things about awakening and all, this article really made it for me. Now, I know what to do when I see these numbers. Pls, Melanie, do send me more info directly. I’ve been noticing 11:11 a lot! I’ve been stopping my activities just to wish for something. I really believe that this could work but I’ve been getting the opposite of what I wished for (I wished to be with a special someone that always made me happy.. but instead, he left me)😞 I won’t loose faith in this and maybe I could get him back one day if I keep believing! I have known about those numbers for some time now, (and seen them a lot), but the way you convey the explanation is so intense and touching ! We can really feel the Energy of Love and the Light radiating from you ! You are very convincing, a great Teacher ! A huge thank you for this great video ! I’ve been facing and through a lot of challenges since June 2016. Today a woman I’ve ministered to some years ago bless me with some food and a monitary gift. As I waited for he to let me know when she made it home, I looked at the time on my phone and it was 11:11 am. Thanks so much for enlighten me to be more aware and to pay close attention. Thank you for sharing your enlightening knowledge. My family is awakening and we have recently discovered: my husband is Master Number 11, Our Daughter is Master Number 11, I am Master Number 11 and born at 11:11pm and our son is number 9. Let the light flow! For years him, me and his sister always seen11:11…..
That’s awesome Judy! Did this post help bring clarity about the meaning for you? I was talking about my step father (who passed 9 years ago) the other day to my bf. Out of the blue, I saw the clock at 11:11. But I never really put it together at the time. Five days later, I read a message from my bf who had just caught a bunch of fish with the fishing rod that I gave him that once belonged to my step dad. I replied and said “I knew he would have liked you”. After I hit the send button, I looked at my clock and it was 11:11. Somehow that made me smile because I feel like it was a “wink” from my step dad saying all is good, chin up. 11:11 is my special number as I see it daily (sometimes twice a day AM & PM) alongside 444 (4:44). Started to notice it around a week before my 35th (also saw 14:04 regularly – my birthdate in numbers) which indicated something big was going to happen to me – then it did on my 35th, I was awakened to my life as it should be & I am truly happy for it. So awesome… And yes! Being awake and on track is the most wonderful feeling! For the past 2-3 years, I have noticed either 1212, or 1221 or just 1:21 a lot. So much I am now aware of it. Happens some times in at night too. Lately I’ve seen 313 and the mentioned 1111 too. Hmmm. Gratitude, I’ve recently came to the realization that my souls purpose is Oneness..This article was the most informative one I’ve read thus far. Blessings to you and yours, One Love. Way back 4 years ago, I was highly attached to online games specifically league of legends to the point that I almost sacrificed huge part of myself as a devotion to the game. After a year or two, I started seeing repeating numbers (1111, 11:11) in following mediums: digital watch of my phone, time on my laptop, coins I that I earned from the game. I started to asked myself. What is the message these numbers are conveying to me? I started to reflect. I quit the game. And I seldom saw repeating numbers again. But after such events and reflection, and even until now, my whole wold have been changing and disorienting. It seems that my old habits or generally my old self is not real and working anymore. It seems like everything is getting clear and the more I listen, the more I see. I started out noticing 11:11 on my phone. I’ve always heard you make a wish when you see repeated numbers like this. Looking back it’s weird it’s always been 11:11. This past year it’s happened alot more. For about a month it’s been either everyday or once or twice a day. I told my brother and mother and have even put this on Facebook. Just a few minutes ago I’m watching this new show on HBO called “Here and Now” and 2 minutes into the show a character saw the clock and it was 11:11. Later in this show he is in a car and googled what this means and I immediately paused it and did the same. Here I am now. This is very interesting and also very weird. I believe in God and Christianity. I was raised this way but haven’t been to church in awhile. I do pray but not on a regular basis. Maybe this is a sign. For at lest 9months more i constantly see 11.11 everywere i go .everytime i look at a clock or my phone or t.v or ask the time i get 11.11 . I no its ment to be a guardian angel of some sort .but im struggling to see and hear whats being said or direction im ment to go . 11:11 on the microwave time. I just saw that 1111 was very special, didn’t get to look it up & forgot about it day or two ago. So after Yahveh Praying, I came & looked it up. Found your site seeming to be probably the best. WOW! Himself, Spoke to me. I’m so happy, & Thankful. And Thank You! So much of your info related to this prayer, that prayer, & so on & on! Expecting great turn around to most all few areas of my life! And so looking forward to all happily, & with a lot, lot less fear & stress! Thanks again. I seen the signs before alot and know of them and now they are back when reading this article it seemed as an angel was tuning in. I saw many times repeated numbers.In the beggining I didn’t know why is this happening but now I know it’s a sign of angels’s reassurance that either I’m on the right path,doing something that is in alignement or that I need to change what I’m doing in the moment.I love being guided by them in this way. I have been seeing 11:11, 1:11 continously for these past few months, now it has increased from just once to almost daily and sometimes twice to 3x a day. And with this i have started seeing some new numbers as well like 7:11 8:11, 9:11, 10:11. 12:11 & more 9:11, can u tell me why? Wow, this is so deep but glad I’ve finally received a better understanding of these codes. I see 11.11 and 1.11 occasionally but mostly 11 minutes after whatever hour I look at the clock eg. 2.11, 3.11 etc. I was also born on the 11th at 11 o’clock at night. I had a friend send me here. My son died last year. I got the head stone today. I had just realized the stone was marked with the wrong birthday. It should of been November 30th. But somehow they had put November 11th. I know I told them the 30th and could of sworn on the proof it said the 30th. But even those say November 11. It will be fixed soon. But it makes me feel better reading this. Losing him was a tragic loss and no one knows how he died. He was even missing for almost nine months till he was finally found in the bottom of a lake. I have been seeing 4:44 a lot, and now suddenly I just saw 11:11 on the clock, and this right at the moment when I was having a very relevant, decisive and important thought about my position in life right now and where I’m headed, so I definitely feel it is a sign from angels. I see repetative numbers so frequently, my kids think it’s obnixous. It’s the strangest thing I’ve ever experienced. At least twice a day (some days more) I see them. 111, 1111, 555, 444, 1212, 222. Over and over I see these sequences. I am a scientist by nature, everything has a metaphysical explaination based on chemistry, so this, for me, is insanity. I stopped looking at a clock for 3 days, but then I’d see the number in liscense plates, telephone numbers on bill boards and advertisments, prices, etc. I struggle with bouts of depression for absolutely no reason. These things only started recently, over the past few years, ever since my birthday fell on Easter. I’ve never believed in that which you can’t see, smell, hear, touch or taste, so this is all kind of freaking me out a bit. I sense something is different with myself but nothing in my life has really changed. Someone mentioned meditating, but everytime I try, I know in my head I’m trying to do something that I don’t understand, I ask myself what is supposed to happen, am I supposed to feel something? is it working? how long do i sit here? and I get frustrated, bored, and give up. I can’t seem to get out of my head. Does someone know how to make the numbers stop? I saw this after a very hard exam I hope it means good grades. I feel LiKE I am also STARTiNG to see some of these SiGNS, but I’m not 100 percent sure what they mean and I don’t know how to FiND anyone else who can see and feel the same THiNGS that I do. Do you have any ADViCE. Thank you for this! I see “111” and “1111” ALL THE TIME..practically every day for the past TWO YEARS. Today, in fact, I saw it twice when looking at the time. I’ve long been wanting to understand what it means for me, specifically, and some of your comments served to confirm what I have long considered. You see, I had an Akashic records reading nearly two years ago when I was receiving lots of mental “downloads” at the time. The reading confirmed my life purpose, something I always felt in my heart I “should” be doing. But two years on, I have yet to make any great strides (depression and self-doubt are a b*tch). 🙁 I think these repeated numbers are my guides trying to consistently remind me of my life purpose and mentally pushing me to get to work on it, already. I recently have been having some physical challenges, so you have started to doubt my purpose. Maybe these continual numbers also serve to remind me that all is not lost. My physical issues are just temporary “roadblocks” and that nothing can get in the way of my life purpose. It may also be a lesson in having faith in my purpose and telling me that it will all work out. I hope so. Thank you for your information and for sharing your insights and resources with us. So what if your last name is Angel, and you are a twin born on 11/11? the same here 🙁 any answer ???? Take it one day at a time, stay in the present. Im always seeing them all;whenever i look at the clock,i see mirror image number (17:17…20:20..16:16…etc.) i tried noting them down as they appeared but ended up writting all the hours (from 01:01 to 12:12 & from 13:13 to 00:00) of the clock.This has been happening for almost 10 yrs now and recently iv started seeing number 13 everywhere,TV,my cell phone and even people speaking the number. please please please help me!!! the last post before mine was done on Feb “13” 2017 …as reflects on my phone. Hi, i have seen 11.11 almost everyday.. My boyfriend’s birthday is on 11 11 also.. After he came in my life my career is almost ruin. After over recent break up after 5 years i am able to recover my loss and found my self lucky.. But he is in touch with me almost a month but i found my self again week not focused on my goad no burning desire towards my goal and also see frequently the number 11.11.. Whenever he is in touch with me i saw 11.11 but but whe he doesn’t lli saw the number 12.12! Thank you so much for the video! since many years iam into spiritual things, recenty i was wondering to get a sign to the things i think are right… many times in my life over years i was seeing 1111.. recently i was seeing couples of times 1111, but this time what i heard from you its going to be definitly on my mind next time i see it, 1111… I see my progress over years and iam really thankful for that to the God, Angels and universe and all people and situation i meet in my life, becouse they are making who iam no NOW;) . You were perfectly understood, Monica thanks for commenting! So glad the video was helpful for you and yes! Next time you see 1111 tune into the light that is all around you! Oh my God! I’m so sorry! I used to be a medium but I was humiliated and sent away to a mental hospital when I was a teenager. Everything I predicted was accurate. I didn’t understand why I was treated that way but I was ashamed and I turned it off entirely. You must live in Los Angeles as well. I have a brother named Shane and my best friends baby’s name is Tyler. It seems like every time I look at the clock it’s 11:11. I’ve always wondered about its significance. Your story breaks my heart and shines some light on things as well. My dad is battling Leukemia right now and I just lost Liv, my blind and immobile french bulldog who I loved more than anything. I will pay attention to the signs from my angels and start living more. I’ve been in a lot of pain for a long time and I’ve lost so much. I can’t waste anymore time from here on out like I’ve been doing. I find your story so interesting. I hope you are staying strong and embracing all the love and light in your life. You sound like a very special woman. Good luck to you. Thank you so much for your guidance. I’m profoundly grateful for your enlightenment. Yes! An open mind and soul is definitely key…. Thanks for commenting my friend! Hi, thank you Ms. Melanie for sending me this message about 11:11, I always been wondering what that means, but now I know!!! Thank you so much!!! You’re welcome! So glad to hear this 11:11 info was helpful for you! I see 1111 all the time. It has guided my to some amazing discoveries. Get ready for 2017!! Something very exciting is about to happen soon. Yes! Big changes in the works… We’re literally raising the vibration of the planet and it is awesome! My dear Springer Spaniel – Gus – died (put down) this past 11/21. His birthday was 11/11 (Veterans Day) 2002. I used to call him my little Veteran Boy. It seems that for the past week, I literally see 11:11 on the clock ALL the time… it has happened two mornings in a row that I looked at the clock exactly at that moment and many other times in between. I have had some senses of him being here.. very subtle… but this seems like a direct call out from him…. wonder what he’s saying…? so why should we believe an internet article? do u have any more was to suggest how to find what 11:11 truly comes from? Don’t be rude. That person doesn’t deserve bad things to happen. I’m seeing it too and I am certainly unhappy. Im unhappy that ths people on this earth is real evil. And you expect more evil and to happen to this person because others manifest their fears and she’s forced to battle it down? Then you take responsibility and pray for that person instead of passing the buck. My mother passed away this past September. Long story short, I was sitting in her room and opened my phone and the time was 11:11, I had read stories on the number 11 so that got my attention so I looked over at her and she was still breathing but the next time I looked she was not, when the nurses came in and checked saying she’s gone the time was 11:15, I believe she passed shortly after 11:11. I saw 11’s randomly for a few days after she passed, one on a clock in a tv commercial that I haven’t seen since. I haven’t seen 11’s anymore until my grandson was born last week, 11-11-16 time 11:48 pm. I always see 1234 curious what that might mean. I have be seen almost all the special combination of numbers for quite some years now. It all started with 11:11. It went up to the extent of me noticing it on 11/11/2011 at 11:11 pm. I sent a message in fb to all my friends and loved ones that I care about them and they mean the world to me. That special moment in my life time that I would cherish. 11-11 is my birthday. It really concerns me to see these dates too often; & it happen just now or at least 3-5 times a day. I’ve been seeing sequence on the clock for quite some time now. I know that spirits are trying to contact me. This has been going on for over three years. The numbers will shift from sequences like 9:11, 4:11, 5:11, 6:11 to 55s.. 5:55, 2:55, and etc. I know that they are hinting to me about positivity and change. However, I would like to know more about this being trying to contact me. I have been seing both 11.11 and 22.22. And I was born Friday 13th at 11.11. I wonder what that meens? I’ve been seeing 11.11 & 1.11 on clocks recently. The same has been happening to me every day for the past couple of weeks! I don’t understand what it’s supposed to mean. Hi Bronwyn, Same here- I see more 11:11 and some times 1:11. I have experienced this 20 or more times a month. I have told my staff and also told them, see now look. I believe a big event is coming and I have heard it will happen when we are sitting down eating or something. I have seen nukes over the U.S. going off several times and a land of destruction. I believed that something would happen on the 11th hour and the 11 minute. I thought it was going to happen September 2015. After that month passed I thought perhaps Nov 11th on the 11th hour and the 11th minute. It did not. I am convinced it represents the signing of the end of World War one and the beginning of War in November 2016 at the 11th hour and the 11 minute in U.S.A. I believe New York will be Nuked with 2 nukes this year at this time. It will happen for sure to New York but maybe not at this date or time. 2 nukes were transported from Nova Scotia to New York recently. God prophecied New York would be getting nuked just like Japan (sunami). Japan was building up military equipment under the waters and was going to go to war against China. 2 Nukes were set off under the water to destroy the caverns. 2 nukes in world war 2. 2 nukes in Japan (sunami). 2 nukes in New York. And Obama (evil) just visited Japan to say sorry for the 2 nukes in world war 2. He should have said sorry for the 2 in japan (sunami) and the 2 he is going to set off in New York. 11 11. It means sometime folks. It shall come to pass the meaning. For many years the number 1111 would be on the clock as I looked but my caller I.d also had 1111across but nobody on the line . I just was blessed with my grandson he unfortunately passed from SIDS he was born at exactly 11 am and on the 11 month. Several months ago I started noticing 11:11 on the clock a lot. Just seem to be drawn to that particular time. If I try to wait for it to come up, I somehow get distracted and miss it. My son passed away suddenly 2 years ago this May and whenever I see 11:11 I immediately think of him. He was born on 7-11-69. My husband is now seeing 11:11 a lot also. Any thoughts? Isnt that crazy…I was just looking up, what 69 means, because i constantly see that number…and then i notice your sons year of birth is 69…no idea what God is trying to tell me…my husband passed away 9/6/13…I am so sorry of your loss…but one of my best memories of my husband was on 11/11/11…at 11:11…i turned on the vehicle clock at just that time…I said, hon…what do you think God is telling us…and he said, you will always remember this…and he was right on! I began seeing this now for years, at least 3 or more. I continue to see it, whether it is on the clock or other places. All over the place. I am Cherokee indian and white mix. The bear is my spiritual guide, I would like to know what this means for me. I will pay more attention to where I am and what I am doing, ect. Keep a record of all of this and see if this gives me more insite on why I continue seeing it. Drives me crazy. lol I haven’t asked my Chief, but definitely will after reading this. I’m glad I looked this up. Thanks for the info. Since my mum died allways I will look at the time in kitchen on my heating thermasta or on sky menu for time or my phone also my daughter who lives with her own family will call and say guess what time it is on all ovations it has been 11.11 it has seriously got to the stage where it has in plan words “freaked ” me out …I have ALLWAYS known it was a sign.yestaday I see something on fb about 11.11/12.12. Ect as busy at time I knew I had to read later further into this but could not find it. It has played on my mind so I went to google it tonight I swear guess wat time it was when I enterd Google ……11.11…… I have read what it says it is know 11.25 …..I am in pure shock…..
Hi. My brother passed away almost 3 years ago from brain cancer at age 42. I started a job a year ago, and I started to notice that the calculator under my computer monitor would have numbers on it when I come to work in the morning. It’s not every morning, but most. I have been logging the numbers since January 24th. I would like to know what these numbers mean. I also have experienced my tv shutting off randomly and one time my garage door opened by itself! I keep thinking it’s my brother. I miss him terribly! Not only have I seen 11:11 a lot lately , but I was born on 8-18 -62 and I have been seeing 8:18 a lot too. If you add up my birthday it comes out to 8. I would really like to know what it means. I also see 4:44 a lot too, and that was the time my first born came into the world. Any answers would be appreciated. Happy Birthday, Denise! I was here looking up the meaning of 11:11 cause I see it frequently and noticed its your birthday! Ok, where do I start? I see 11:11 every day on the clock, 1:11, I was reading the article about 1:11, I look in the corner of the computer the time is 1:11 and I got a wave of shivers over my whole body. I swear in my peripheral vision I am seeing a white but see through shape of an angel. The numbers thing has been really strange my birthdate is 8/18/1981. I see 8:18 everywhere everyday along with the same numbers. I have been so curious of the meaning of these numbers I started studying numerology. I understand overall how it works, but have not come to any conclusions. I feel like its a warning but I dont know to what. I want to figure this out so bad..It’s always on my mind and I can’t escape it! Any comments appreciated! So what does the Age of Aquarius mean? My Birthday is 11-11-55 and I was born at 11:55 am. What does this mean. I have been told many things. I love numbers,,,,they are everywhere. Numbers don’t lie. They either add up or they don’t. I see love ones in nubers,,such as birthdays, 12 as in December 31 as in the day of birth, 7 as in July, 58 as in year July 1958. I see numbers ALOT!! sometimes I can connect the dots & sometines not. My father passed away on June 11th at 11:11am in room 11. This number also appears to me on clocks many times. It is always showing up in my life. I always see 11:11 and other ones like 12:11 or 9:11 all with 11.I was just wondering is this a good sign or no? I had a son who was born on 11/11/81 for many year I had seen this no. appear when I happen to look at the clock, or cell phone or the time on the microwave. Jonathan was born on Veterans Day. His daughter Olivia was born on Pearl Harbor 12/7/2004 she was 11 years old. Recently they were shot to death on May 3rd 2015 with another fellow Christian. Jonathan’s last words were to the shooter were ” May God forgive you!” All three of these victims died because of a man who served our country had become homicidal and suicidal and did not get what he wanted out of life and took 3 lives and almost took another and many others could of died as well. I thanked God that night for my family and for my Grandchildren, and In laws a few hours before the shooting, that He would hold them close, protect them, keep them safe, and my family would grow and mature and continue to love and serve Him. Also I asked the LORD when in time of need please sens them their Guardian Angel. I believe that Jonathan’s last words are so powerful and that we all need to have God to forgive us of our sins and we are all going to die one way or another so like Sam who posted about the 11th hour and the judgement of the 144.000 is worth repeating about the no. 11 means. Now looking back I should of been praying on the 11th hour in a different way. God is in complete control and allows man to a free will, even though a man or a woman is selfish, sick with mental disease, or what religion you or whatever you do not believe, we need to be right with God our LORD who is the Christ our Savior! The Holy Bible is full of number sequences and what God said will happen, happens and is still is to come. He gives Eternal life to those who believe. When God sent a part of himself to earth I am sure that he grieved. So count the cost and if you are lost and come to the “Good Shepard” Jesus Christ, confess that you are a sinner and are in need of a Savior, and your sins will be blotted out by the precious blood of the Lamb, and your name will be written in the Lambs book of Life! I see 11:11 a lot , and today my IPad lit up with a game request and it was 11:11 …. feeeeekey . My struggle…why should I care about 11:11? 1)	Light up!!! Wake up, relax, have fun! 2)	Turn off the chatter box inside your mind, meditate, and listen carefully. 3)	Everything will be fine – just trust! 4)	Don’t give your power away. Angels are here with me. No matter what I’m doing, day or night, every day and night without fail, I will always be drawn to a clock at 11:11, and I always make a wish. Never really knew why, I just do. I’ll even wake up at night and roll over and look at the clock, and sure enough, it’s 11:11. Somebody once told me that it represents living life to the fullest. Now, from everything I just read, I believe it’s also guardian angels giving those of us who maybe aren’t living our lives to our fullest, healthiest potential reminders to do so. I’ll continue to make wishes, but I’m going to really delve in to what I’m feeling at those times and take actions as well.Thank you for this article. My birth day is 11, and the 11 it show it self for years lately 11:11 or the double 22 :22 start show it up on daily basis. 1 day i was in Buss and nothing to do except think of God and doing reiki in my mind, at list 7 -10 cars passed/parked on roads near buss with nr 11 on the plates and 1 or 2 with nr 22. It means sleep again for an hour and half. My 11-11 has been going on for years. At first is was seeing it on the clock several times a week, then I would see it where ever I go,Chicago,Kansas Atlanta, Houston,and now los Angeles. It’s not just a clock, watch,car clock,I have asked someone the time. Several times my roommate woke me and I would ask him the time,11-11.my nephew bought me airline tickets last year,11 month,11th day. I could go on and. I frequently see this number 11:11 and I feel something positive lots of positive thinking n experience. Hi Catherine, All I can tell you is what’s happening here is uniquely personal experience that only you will discover if you listen too your feelings with it. If your waking up at night what are you dreaming about? what’s the first thoughts you are having when this happening? write it down. I can only tell you from my own personal experience that it will be something positive! I kept seeing the number 11:11 recently so I listened to my instincts with it & unbelievable I found a half sister I never met before who happened to be adopted at birth on 11th nov (info I didn’t have before) !! My head is in spin about it but it has been happy & positive experience for everyone involved. Listen to the message that comes shortly afterwards mines was to find my birth sister!!! i am not only seeing 11:11 in every clocks, cars plates,, receipts, but i had a visit in my dreams where this being hold and guide my hands cutting vegetables on a table kitchen,, he was a big guy with strong hands,, i felt sweet energy from his hands and i didnt see the energy but i am sure it was either blue or violet…let me tell you that i am not a very religious person ( but i feel empathy for others and i am incline to budhism ) and i wonder why this is happening to me, i am just a regular joe with issues…. also i just received my passport card and the numbers are 11116123.. if you sum the numbers 6,2,3 =11,,,also i like to read about methaphisics and cropcircles and ufos,, and religion… then you know we have a long way to go and learn.. When you had connected or an angel follow you,you will see visions by angel want show to you in many ways. My Father recently crossed over 23 August 2015. he came and spoke to my sister yesterday, he has asked for his memorial service to be held at 11am on the 11th of September 2015. Prior to his death and since then I am surronded by 11, 22, 222. I am experiencing this since last ten years, but I saw almost all the numbers 00:00 ,1:11, 11:11, 12:12, 2:22, 4:44, 5:55, 22:22, 3:33, 18:18 etc.Therefore I am ignoring to see watch with digital no. Last ten years I don’t have good time as well. I searched therough the net, but today I found the similar thing. I am happy that I am not alone. Like you I also study Numerlogy. 333 is my most seen number, but today was the first time I saw 111111. So cool to know that Angels are starting to talk to me. I am facing 11:11 for past 6-7 years on mu phone,specially at night..I wondered what kind of omen is this..Sometimes it frightened me..I dont know what to do..Sometimes,I am just sitting,doing nothing,unlock my phone without any purpose,and see this 11:11 again..I am still confused what it signifies. Hi Melanie..i saw this number from yesterday’ and also today. At o’clock 11:11 and also when i was driving. MY DAUGHTER WAS BORN 11.11LBS! WE WERE IN ROOM 151! AND 5/15/15 IS HER BIRTHDAY! It began about 17 years ago. The number 11 is now a constant. As of late I see 11:11 just about every single day. My husband and I both will yell out when we catch the number 11. Now my daughter who is 31 is catching it as well. My birthday is 9/12/64, my husband’s is 12/20/70 and my daughter’s is 4/5/84. I see no correlation with these numbers at all. But my mind has been open for a very long time. Long enough that I thought people would think I was weird and then I met my husband and we “build knowledge” it helps with living in this world. My daughter is slowly coming along as well “lol”…. she surprised my with her knowledge that there is more to this physical world and is now also see 11. What does this 11:11 MEAN??????? I also keep seeing the numbers 11 11. On our microwave (whitch time isnt even right) on my phone and on my watch and the weirdest of all when I wake up in the nigcht and see 11:11 on my watch!!! Please angels keep me protected from negative persons. Keep me cool calm and collected. Wow 11:11 was for me the question of my life because i see this awaking code many times, was for sure my call on the Spiritual Way or Service, personal i am in contact with my Guardian Angel and i am so grateful for this mesager that i read it now. Thank You so much i love You for share this secret with us !!!! I prayed last night to God and Archangles Gabriel and Raziel to have a clear communication with God and when I opened my facebook now, I read your message and I am not aware about number. When I saw 11:11 today, I tried to remember that number when I first saw this number and I was surprised that is the birthday of my friend from India. I am a widowed for one (1) year and I have friend from India thru sykpe and I have always question in my mind if he is true and sincere to me. He told me that my picture was pop up only on his laptop that is why he contacted me. We have friend for 7 months already. His birthday is 11:11 (November 11) That was the first time I saw that number. Do you think it is related to my life? You explained it perfectly. Mine started in 2013 though. I have been seeing 11:11 for two years now and I just don’t understand what it means. I FINALLY FOUND THE ANSWER TO 11:11!!!! I AM SO EXCITED RIGHT NOW AS YOU CAN SEE. THE LORD IN HEAVEN MADE US ALL IN HIS OWN IMAGE,ONLY THE CHOSEN,FAITHFUL UNDERSTANDING AND SEEK AFTER WHY.THIS IS THE BEST EXPERIENCE EVER,KNOWING THAT THROUGH SEEKING AND ASKING THE LORD WILL GIVE YOU THE ANSWERS!! !I WANT YOU TO LOOK AT 11:11 AND ASK YOUR SOUL WHAT THIS MEANS TO YOU. THE HOLY SPIRIT LEAD MY BIBLE TO MATTHEW 7:7, BECAUSE LIKE THE CHOSEN I SEE NUMBERS LIKE 11:114:44,777,11,44,55,911,10:01,12:12,ETC EVERYDAY!!!!!!! been seeing this number for a while almost every time I look at the watch and everywhere have this heat on my body I found it’s the chakras,this heat I can feel in all my chakras and few times something run up through my spine and over my head.was seeing prophetic dreams out of this world experiences saw Jesus was in Him.I see myself in everyone in my dream i feel like it’s happening to me.It was not easy sometime sometime it is beautiful 2011 to now lot of things happening.maybe the universe wants me to say that we are all connected that we are all one.etc.I’m resting. I am seeing everyday for over a year any number before 11 every time I look at the clock, stove, cell phone and microwave. Can you please, please tell me what this means? Thank you. number 11:11 always apair to me… what is the meaning of this? Ok what does this number 11 mean? Well all my angles please keep me protect and bless me with health strength wealth love and motivation. Keep all gossip negative evil jealous energy away. been 12 mths now since the passing of my brother whom he looked after me like a father….since then seeing all these triple numbers has so much intensified especially 2.22 4.44 11.11 1.11. Sometimes I rufuse to look at the time especially when I wake up during the night or early hours of the morning when this mostly occurs as it bothers me…I don’t understand whats happening. Today I started shifting to another place and my pedometer in my car read the number 2 5 times in a row. I really enjoyed this post. For the past few days, I have been seeing 11:11 on my clock in my kitchen, specifically the clock on my coffee pot. I have never once came across this before until this weekend. I think the angels want me to be more aware as you mentioned in the article. I also think the angels have a sense of humor to have this appear on a coffee pot, since it sounds like the message is for me to wake up! Coffee is what I go to first thing in the morning to wake up! Thanks for this, I always tend to see 11:11 on the clock when I feel my most spiritually in tune. I know I’m on the right path. not only have i been seeing 11.11 4.44 2.22 and 10.10 for the past year os son i just realized that my only living son was also born on 11.11.11.
i have been feeling pretty down the last couple of years but after reading the meanings of these numbers i now have new found hope. The last time I saw my father alive was on:11/11/11. Ever since, no matter where I’m at, no matter what time of day, when I look at the clock it’s always: 11:11 or 1:11. I find comfort in knowing a higher being is responsible for this. My son notices the time too, and whenever we see the number together; We always pause and say a “hello” to my dear dad. It has only been happening to me this year. I have been seeing 4:44, 3:33, and 11:11 alot. I’m not sure what is happening but I have felt a little different since this has been happening. Please help me tap into whatever it is. I feel like I’m supposed to do something but I’m not sure what it is. Recently my division at work shut down. I was holding down two jobs. Both in the music industry. The same day the division closed down, my boss sent me a message at 11.11 saying he will call me, that the 2nd job is being restructured. Ever since….I’ve been noticing the numbers 11.11 and 1.11 on clocks and my car clock. I never took any notice of it. But I have been asking the Angels for guidance as I want to do the same business on my own. Now I read this and it seems to be confirmation to my thoughts abt my new venture. Sends shivers down my back. I started noticing often times when I looked at a clock I was seeing 11:11. This have been ongoing over the past couple of months. I’m curious if this relates to the passing of my dad. My dad and I were very close and he wasn’t accepting to the fact that he was dieing. He passed away in October. I have since been trying to find peace with being without him and remembering all the great times but it’s very hard. I always heard that people receive some sort of contact from the other side in different ways for example finding nickels or butterflies etc. I on the other hand am still trying to seek my connection and question life after death and if it exists. I believe in god but am not religious. I am questioning my fate and views on life everlasting. I have 2 children born in different years, and months both born on the 11th, which is also my Mums birthday too, I always wondered if there was a connection. My father died at 11:11 on New Years Eve. What is the significance of that? He was a very special man. Yes the numbers do have great significance to those who wish to maintain an open mind when it comes to a higher realm in our spiritual growth. I have for many years seen 11:11 and have grown to realize for me there are two parts. The 1st tends to appear (for me anyway) after I have had some deeper thoughts on an issue which later the number always comes up. I take it as a positive answer from my Angels.Spirit Guides. The other time I see the number (again the same 11:11) not relating to any particular issue I am thinking of. But rather in getting the message( or more the feeling) that it’s time to meditate as something more needs attention and by going into meditation I start to received a message. This could be a vision that can come in many ways: a group of words, somethings a certain vision of a segment of a movie, my part is to learn to decipher that meaning, sometimes I will see a book title that grabs my attention or I have seen at home a certain book seems to be sticking out and out of place. Thank you for bringing this up and look forward to seeing and hearing more from you. Take care the light is with you always. Thank you, now it makes sense. Often I see numbers which repeat. For example 11.11, 10.10, 12.12. Can you suggest me what it means? Thank you! May grampa died around 2 years ago and today i woke up at 11:11 does this mean something. Hi I have been seeing 444 since my brother took his life 13 years ago. My Father took sick and passed away almost 3 months ago. My Father time of death was 444 in the morning. I think I AM STILL IN SHOCK. Do you know what that means? I lost a son in 1998, he was shot to death. In 2004…I started to see the numbers 11 11…everywhere, but it would go in spurts…and usually right before something either good/bad was about to happen. I wasn’t much for computers till 2007, when I decided to google, what it meant. Even tho there was several meanings. One really set me off. It said that an angel is trying to contact me. I started to cry, and my ex, was freaking out, cuz a minute before this…I was laughing, and having a great time. Now…even tho he is my ex…we are still friends. One day, he says to me…”thanks Sue…now I see it.” lol. Maybe, u can help me to understand this. What actually brought me to your page, I saw 11 11 twice before noon today. I was born on 11/11/61. I turned 50 on 11/11/11. I see 11/11 all the time as well as 444 and 555 and 123. I had a talk with my grandmother before she dies and told her to give me a sign she was ok. The night she died I saw 11/11 and se it all the time now. The 123 is the date of my boyfriend’s brother’s birthday which I see a lot too. He commited suicide 30 years ago. Not sure where rhe 444 and 555 come into play. I do feel my angel guides are with me as well as my loved ones who have passed on. I was born on 11.11.1969, lost my id and the second one was printed on 11.11.1996. I see 11.11 always on the clock. Hi, I have seen 1111 in many forms since 1977. It was great when I learned other people see it too. But knowing why is still a mystery. Eu sou brasileiro e tenho 45 anos. Vejo o 11:11 com grande frequência, desde julho de 1985. I am Brazilian and I’m 45 years. 11:11 I see very often, since July 1985. Hi I started 1 year ago and I can not have a rest I now I born on 10-11-1988 my live is sow deferent I think some how people now what I think it’s like like day are watching me u should now to if you see 11 . Think I exp it,,,I think day don’t want two tell me nothing but I think they now who we are I see birds it seems like day are whatching me. Pay addition .and u we’ll now what I’m saying . On clock, to me apair maybe for ten time per day the numbers: 09:09, 11:11, 15:15, On clock, appears to me maybe for ten time per day the numbers: 09:09, 12:12, 15:15, 19:19 etc. and sometimes 11:11. Please, what does it mean ?19:19 etc. Please, what does it mean ? My bday is 111666 and I am definitely not of this world. Often when I am watching tv at night I look at the clock at 11:11. Sometimes if I am watching a recording, I will check the time remaining and the 11:11 comes up. Why? I am trying to understand what it means. I was born in November and the time was 11:30 am and my street address is 11. Any significance? I see 11-11 very often. I used to think it meant my Dad was near. He has been gone 40 years. Now I believe it is also my husband, Walter, who died from cancer 18 months ago. I even talk to them at those times. So true I do Angel healings all time see that number all time I help so many people out there prayers are coming true always helping them I am even reading a book about about my website and what happened to me and what kind of gift. I have i wish more people will understand thanks for sharing Fabio. I drive but not a truck, my licence plates don’t have these numbers, and my house adds up to 9, and my “number” is 1. My sons birthdat is jan 11,2011 or as most write the date 01/11/11….what does this mean ? MMy son was born at 11:11 he is now 41 yrs old. We were talking just the other day how often we both keep seeing 11:11 do you believe there is a reason so many of us is seeing this number? For the person seeing numbers all the time 222 333 444 etc, I also had this. For me my life was falling apart and I was surrounded by abuses and deceptions that I was trying to shove under the rug and ignore. I left an abusive partner who was trying to blackmail me for money, denying me access to my child, had found out my mother had committed fraud on my fathers inheritance and was dating someone who I found out was cheating and lying to me. During this time and I was in denial and refused to say anything and just tried to suppress all my feelings. I ended up in and out of hospital due to the stress I was under. This whole time, I was waking in the night at 222, 333, 444 etc. I was also seeing 911 a lot too which, kind of got me to really pay attention. Once I understood that I was being “woken up” to actually wake me up LOL, I stopped seeing these number patterns so frequently and could sleep throughout the night. I began to leave those relationships behind and focus on spirituality more, which all the drama had been keeping me hyper-focused on trying to cope with it all. What people don’t know is that 11:11 is connected to the 11th hour workers and the 144 thousand who are called during the time of Judgment. This is not to scare people and not necessarily negative, but it is a wake up call that calls the person receiving the call into spiritual service. This idea comes from the bible and prophecy much like the idea of rapture and ascension. The 11th hour is the time where Earth is at a crux and a choice needs to be made. It is the last hour to make a decision. The fact it is 11:11 presses this more strongly. If you see 11:11, you are likely being called into SPIRITUAL SERVICE. Even in Matthew it states it is not a time of idleness, there is work to be done. So probably why people start seeing 11:11 when they begin to wake up spiritually and to communicate their spirituality so others can be awakened. The 1 energy is the magician. Upright, the magician uses his magic for good and births good creations. In the negative the magician is self-serving, manipulative and the con artist or used car salesman mentality. Which this energy we are being called to overcome within the world. The 4 vibration (all the numbers adding to 4) is about grounding or lack of it. Which all the 1 energy, if used for too many projects can be scattering or cause burn out. 4 can also be about authority, being the emperor card. So, again note whether in the greater world or in your environment power is being used constructively or being abused. But, if you want to see 11:11 for self-service you will see it all the time because you want to see it to gratify personal goals. If you are motivated to answer the call, however, you can be part of the 11th hour workers at a time they are most needed on Earth. I see 11:11 alot and your article is great guidance on paying attention to the messages I am intended to receive. Normally I focus on what I am intending to manifest. I will continue to do that and now I will be sure to pause and meditate for any messages for me. My grandmother and I were very very close. She was everything good in my childhood and my happiest memories were with her. Her favorite number was 11 because she was born on the 11th hour of the 11th day of the 11th month (11/11/1925 at 11:00). She always told me this. When she passed I had spent 8 days by her side caring for her (I lived 2 states away). After she passed I was devastated and I would look at the clock at 11:11 just by chance. This happened about everyday or twice a day for a long time. I called my little sister who was raised by my grandma (they were extremely close), she lives in a different time zone. She said she was seeing 11:11 too. After about a year I started to put the connection together that she wanted me to make sure my sister was safe and cared for and for my sister to always let me know how special I was to my Gram (I was just 1 of 46 grandchildren). Also, when I am just thinking of my Gram or missing her, she appears at 11:11 (she did tonight when I was wondering if my favorite singer on “The Voice” would make it through another round, I looked at the clock and knew she was giving me the answer)! To me and my sister, 11:11 is our sign that she is with us. We never saw it until she passed. My mother suddenly passed away at the young age of 46. She loved ladybugs and since her death 20 years ago, we see ladybugs at just the right time (I saw one in a blizzard one time). The other night was a very hard night and I was wondering what to do about a situation. I was walking down the stairs and saw a ladybug…I had my answer! I have a very strong faith in God and know that he is above all. He is who I get all my strength from and I feel blessed that I know my loved ones are safe and happy. God bless! I started seeing this number and I would always tell my family to make a wish! I also started seeing other Angel numbers but didn’t understand why I looked at the clock at those times. I went on Internet and searched for consecutive numbers and lo and behold, I was graced to be guided to this Angel site and very, very excited to keep learning from you. I also had an intuitive urgency out of nowhere yesterday when I was giving my husband a haircut. I felt the need to check on my 3 yr old so I did. He was fine but when I checked for my 10 yr old, he and cousin were lighting grass on fire! I was amazed I had divine intervention and that I was able to grasp it! It was an amazing feeling! I look forward to discovering more about my Angel Guides! Glad to have answers to many questions! Thanks! I see 11:11 sometimes twice a day lately and have been wondering what it means. It gives me such warm, knowing feeling. I know there is a message for me and I need to figure it out. 11:11 appears to me EVERY day as well as 222, 333, 444, 555 and mostly 1010! I love it! I was wondering if you could let me know what your thoughts are about my landlords dog Gina. She was a rescue puppy she was born on the 11/11/11 we live in an 11 house. My landlord is an Anglican pastor his wife a doctor they are not into numerology etc. I have my own little flat I work as a massage therapist and Gina practically lives in my place which I love. She often comes to me at night to keep an eye on me. I am extremely attached to her. My surname also adds up to 11.